For students with complex communication needs (CCN), our understanding of their communication abilities is informed by first developing an understanding of the whole child through dynamic assessment. At The Bridge School, the educational team works with parents and students to assess motor abilities, seating and positioning, likes and dislikes, communicative behaviors, use of communication support technologies, social networks and other relevant skill areas and developmental domains. Using dynamic assessment means that students and staff are active participants in assessment procedures, and these procedures are process-driven and modified as needed so that we end up being able to describe the supports and modifications necessary for students to demonstrate certain skills and abilities. We find it counterproductive to use traditional observational assessment procedures which result in identifying deficits. Dynamic assessment is a recursive process; therefore assessments lead to setting meaningful goals and developing appropriate interventions, outcomes/progress are re-assessed periodically, leading to the development of new goals and interventions. 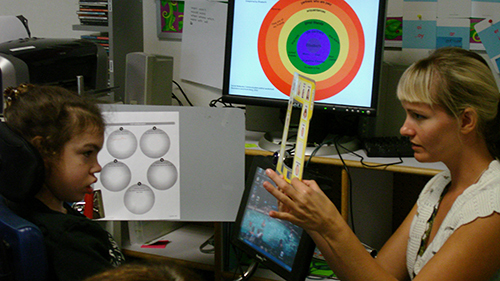 During communication assessments, Elisabeth and her Speech-Language Pathologist interact using several of her communication support tools, including her eye gaze communication symbol boards. Providing appropriate accommodations needed for participation in statewide standardized testing.